This program opened up my way of eating. Before, I was blind to reading labels and portion control. I would always diet and then gain it back again. I will stay healthy and slim for life thanks to this program. I also learned to ask God for help in everything I need. I have been praying to God to help me learn strategies that could assist me with taking more control over my eating habits over the last three years. I’ve been consistent with exercising but totally inconsistent with my eating habits. I have learned so much from this program. More importantly, I have learned to keep God in the midst of every aspect of my life. This program has been life changing. When I started this program, all I imagined was a slimmer me. However, I soon realized that this program would give me the tools and knowledge to assist me in making informed decisions and choices. The spiritual aspect of the program has helped me to understand just how much I need to rely on God for every aspect of my life including managing my weight. I am truly grateful for this experience because I am able to not seek a quick fix or overnight success but by methodical planning and praying, I can achieve success. Praise be to God! I have been to Weight Watchers, Nutrisystem, and Jenny Craig, and I was able to lose weight with all the programs but quickly gained it back. Weight Loss Transformation addressed all the deeper issues of my eating as well as learning to eat healthy. Elizabeth is not just a weight loss counselor, she is a life coach!! My relationship with God has grown deeper and I now realize that Jesus is interested in every aspect of my life. I have learned to rely on God more to help me manage food intake and exercise regime. Spiritual Wednesdays are awesome! Right on time! When motivation begins to wane, spiritual Wednesday was the perfect resource to put me back on track. Elizabeth’s tools and strategies are extraordinary. The webinars are great. The more information and understanding I obtained the more powerful I became. I feel stronger and more in control of my not only my eating but my life. I used to roller coaster diet and exercise, now I am able to maintain consistency. My weight loss journey has been fraught with twists, turns, ups and downs. However, 8 months and twenty pounds later I am much more aware of potential detours, hazards and pitfalls. There is no question that success for me can only be possible with the help of The Lord. It makes all the difference to daily pray and give to Him my plans regarding food and exercise. Today, I am a consistent exerciser – in the gym “most days”. My family thinks it’s too much, my friends just shake their heads but I’ve learned that this is what it takes to be healthy. There is no end to this journey and I have many miles to go however, I’m confident that I as I continue to work with Elizabeth, the road will become a lot smoother. Elizabeth’s Weight Loss Transformation Program helped me with my weight issues and my facial acne. Many years I went to different dermatologists for my acne and received medication for my acne with little success. But with Elizabeth’s education in nutrition and the body and her gifted understanding of emotional and spiritual components, she helped clear my acne dilemma. With Elizabeth’s customized program for my weight, acne, and spiritual health, my face continues to be acne free without the help of medication. Also, I have reached my weight loss goal and I feel my relationship with God has grown and deepened. In the Weight Loss Transformation Program, Elizabeth will provide you with manageable realistic goals that are attainable and not based on deprivation. I reached my weight loss goal and have a clear face. Anyone joining Elizabeth’s Weight Loss Transformation Program will truly be enriched, blessed, and most definitely transformed. I work in a high stress environment within the nonprofit sector and make every possible effort to monitor what I eat. But now I’m also monitoring why I eat. Am I hungry or is the food serving to comfort me as a learned behavior? While it will take time to unlearn the behaviors that I have crafted for so long (over 35 years) to insulate myself, my life will be richer and I will be closer to feeling true joy when I eat with purpose. I now provide nourishment for my body after working with Elizabeth. I understand that feeding is not a substitute for feeling. Eating will not resolve problems, but sitting in the moment and understanding that I am strong and will get through this is. If anything, that is what working with Elizabeth has given me. A better sense of self and a closer relationship with God in relation to food. Prayer at mealtime takes on a whole new meaning. Let Elizabeth help you as she continues to help me. I have been a member of a gym for many years. Despite exercising regularly I was experiencing little, if any weight loss. I was then introduced to Elizabeth Madison, an onsite nutritionist by my trainer in late December 2012. My first encounter was great, and since then I have been a dedicated client. I quickly learned how important nutritional values, eating habits, and motivation compliment exercise towards achieving your weight loss goal and I have changed my eating habits. While it is sometimes challenging, my spirituality helps to put things in perspective. I thank God for his guidance, wisdom and His loving care He provides for me and allow God to take control. To date I have lost 41 pounds and dropped 3 dress sizes. I think more important is the fact that I have been able to prepare healthier but tasty meals, read nutritional labels and while at functions I allow myself to indulge a little, but chose healthy sides. I also learned not to be obsessed about numbers on the scale because it is not the only criteria used for weight loss. I found that being fully engaged in the process I learn so much. I feel so much more accomplished because I can honestly say that I have adopted a healthier lifestyle and am seeing results. While never having achieved 25 pounds of weight loss before, it certainly is not my first time at the rodeo. 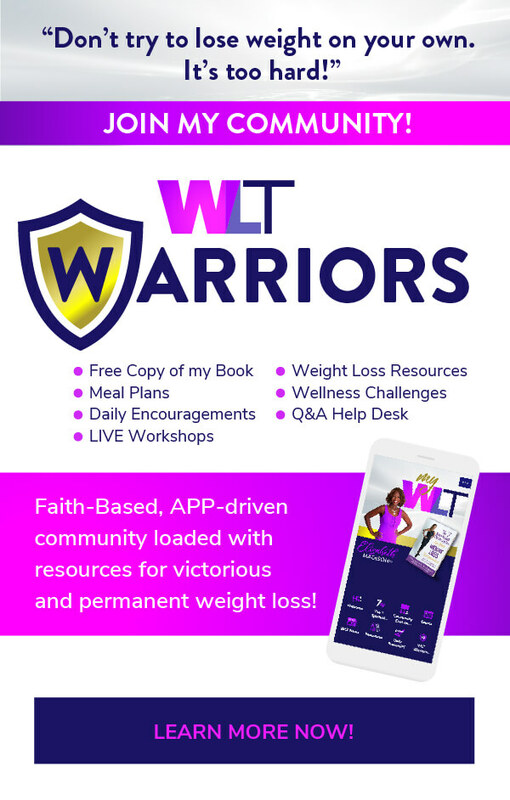 Over the years, I have tried Weight Watchers, Overeaters Anonymous and even participated in a church-based program that netted me zero pounds lost. The difference this time is Elizabeth Madison and her whole attitude and approach. Not only has she gone through what we are experiencing, she has done the academic work to prepare herself to intelligently pass along her own hard-won victories. I have had a gym membership at one place or another just about all of my adult life. Too often in the past, the money would be wasted. These days I walk around with a “God is with me” feeling that is so strong that even when I am “off my game,” I know that God is rooting for me and I need to get back on track. I’ve also made space in my home to exercise on days when it’s too cold to go out. The combination is working out very well. Before beginning this weight-loss journey, I never had read the bible on a regular basis. Now I read it daily as part of a three-year plan to complete the entire bible. What a blessing to better understand God’s word for myself and to see the context from which so many favorite scriptures and passages come. I find myself going well beyond the scriptures assigned daily, doing research into word meanings and reading commentaries of theologians. It is an uplifting experience. Since beginning my sessions with Elizabeth Madison, I have learned so much about myself, and my eating habits in particular. I now understand better why I make certain food-related choices. I learned while meeting with Elizabeth that I view food as my companion. I am therefore working daily to increase the amount of non-food enjoyment in my life. So far that includes going back to reading books and even teaching myself to play the piano! In terms of real change, I no longer bring home cookies and cakes when I go to the supermarket. Also, I am getting more and more comfortable with going into the office without having something sweet to eat in my bag. I know that some days will be easier than others, and Elizabeth reminds me that emotional eating indicates that I have to work on issues in my life that lie beneath the surface. I have begun to identify those issues. All in all, Elizabeth is giving me the tools and the confidence to get me to a better/happier place in my life. I am so grateful to have the privilege of being her client.